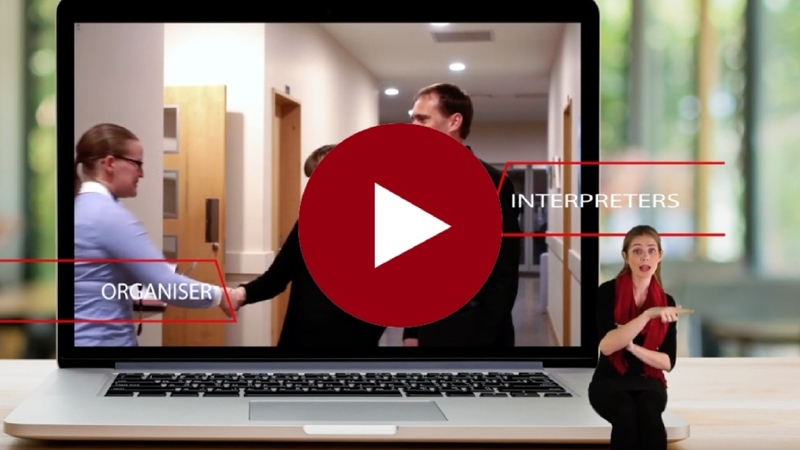 What does a sign language interpreter do? A sign language interpreter facilitates communication between Deaf and hearing people by interpreting between New Zealand Sign Language (NZSL) and spoken language. The interpreter’s role is to convey meaning between spoken and signed language, not to become involved in the interpreted event in a substantive way. The interpreter will not offer advice or opinions on the situation, other than to assist participants to work effectively with the interpreter when necessary. The interpreter will keep the interpreted interaction confidential. What does it mean if a sign language interpreter is a member of SLIANZ? What do I do if I have a complaint about an interpreter? All qualified interpreters listed in the SLIANZ Directory of Sign Language Interpreters, as well as associate members (if they undertake interpreting work) are expected to follow the Association’s Code of Ethics and Code of Practice. If a consumer feels a SLIANZ member has broken their Code of Ethics, a complaint may be made. See our complaints procedure. Speak and look directly to the person you need to talk to, not the interpreter. There is no need to say “tell him…” or “ask her…” The Deaf individual will be looking to the interpreter to receive the message. Speak at your natural pace. The interpreter will ask you to slow down if it is too fast. You are not required to pause mid-sentence to wait for the interpreter. There may be small delay before the interpretation starts. This is because they need to interpret the whole concept or sentence. The interpreter may ask the speaker to clarify a concept/word or to repeat a sentence, they will usually say something like “the interpreter would like to clarify, is that ….?”. This is in order to be clear that it is the interpreter asking for clarification and not the Deaf/hearing participant. When either participant is talking the interpreter will use “I….” and “we…”, facilitating a more natural interaction and rapport between participants. Interpreters are required to interpret everything they hear/see in a setting, this includes environmental sounds such as telephones, conversations etc. Private conversations you don’t wish to be interpreted should be conducted outside of the setting. The interpreter is present only to facilitate communication between Deaf and hearing participants. Please do not ask the interpreter questions or ask the interpreter to be involved in any way other than interpreting. Seating needs to be arranged so the Deaf person has a clear view of the interpreter and of the person or people speaking. Ideally the interpreter will be well lit and in front of a plain background. Avoid placing the interpreter in front of a bright window or busy backdrop; these settings make it harder for the Deaf person to see the interpreted message clearly. Please note, if the room will be dimmed, or lights turned off, the interpreter still needs to be visible otherwise the Deaf individual will no longer be able to access the information being interpreted. Interpreting requires intense concentration and physical effort. To maintain a high standard of accuracy, the interpreter will require short 5 minute breaks during an assignment approximately every 25 minutes. If the assignment is over an hour long, or complex in nature, then two interpreters may be required to work as a team. Please be mindful that although having two interpreters does enable them to work for longer periods without the need for a break, the Deaf person will still require regular eye breaks to avoid eye fatigue. Watching an interpreter for a long period of time can be very straining on the eyes. Also, during breaks, please be considerate and ensure that the interaction stops so no one is excluded. Be aware if reading material, including slides, are being used during the presentation, the Deaf person will need time to read the material before you resume talking. It is extremely difficult to watch the interpreter and read or write at the same time, and the Deaf person may miss important information. This also applies if the Deaf person needs to take notes. When you ask a question it is helpful to pause for the interpreter to catch up in order to give the Deaf person the opportunity to participate. The interpreter can only interpret one message at a time. If the interaction is likely to involve many people talking at once, or will be very animated, it may be prudent to appoint a facilitator to ensure people take turns when talking. Accuracy of interpreting is improved when an interpreter has prior understanding of the situation or communication they will be interpreting. For this reason, interpreters may ask consumers for a short briefing about the nature of the situation or for background preparation material, as appropriate. The interpreter may require copies of any written material to be used during the interaction, two days prior to the assignment, i.e. ; PowerPoint presentation, minutes, lecture notes, etc. An interpreter will usually arrive 15 minutes before the start of an assignment. This is in order to meet the Deaf individual to establish their preferred mode of communication, to clarify any vocabulary unique to the situation, and to meet the service provider to gain extra information about the content of the assignment. 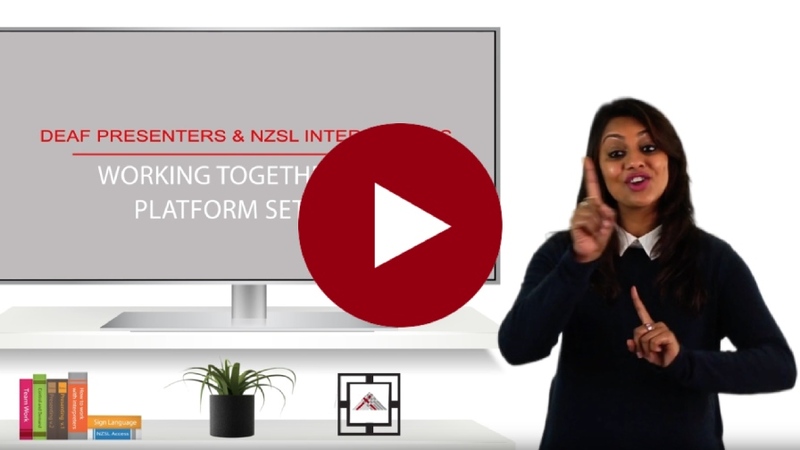 A detailed guide to working with NZSL interpreters, produced in collaboration with SLIANZ, can be found on the Office for Disability Issues website: A guide to working with NZSL Interpreters.